Free Shipping. The Aetrex Essence E250 Laura Comfort Slip-On Footwear is designed to meet the demands of both fashion and function. 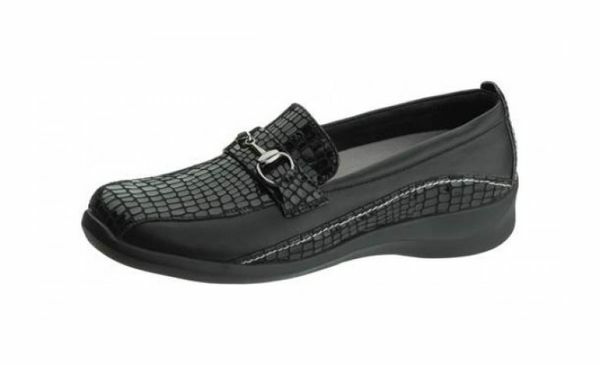 This black, alligator slip-on is made of luxuriously soft full grain leather and incorporates linings made with moisture transferring polyester fabric for maximum comfort and breathability. The E250 also features 1/4" removable depth in two layers - a patented Aetrex Performance Insole and Aetrex's innovative PRST for customization and fitting flexibility. Free Shipping. The Aetrex Essence E250 Comfort Slip-On Footwear is designed to meet the demands of both fashion and function. This black, alligator slip-on is made of luxuriously soft full grain leather and incorporates linings made with moisture transferring polyester fabric for maximum comfort and breathability. The E250 Laura also features 1/4" removable depth in two layers - a patented Aetrex Performance Insole and Aetrex's innovative PRST for customization and fitting flexibility. -60 years as leaders in the pedorthic industry. -Full grain alligator textured leather upper. -Essence Last: Semi-straight, snug rearfoot, comfortable forefoot. -Mozaic: pressure relief insole for customized comfort. -Removable inserts: Two removable layers for fitting flexibility. -Narrow, Medium (B/C), Wide (D/E) and Extra Wide (2E/3E) widths available. -Available Widths per size: N(2A/A), M(B/C), W(D/E), XW(2E/3E). Model: Aetrex E250W LauraView all Aetrex Shoes items.